Florence, the regional capital of Tuscany and the widely acknowledged cradle of the Renaissance, owes its splendor and unique influence on the development of the western world in great part to the dominant ruling family of the period, the Medici. Staring in the mid-fourteenth century their far-reaching patronage of the arts left an indelible mark on the city. The emulation it encouraged in other powerful families created an environment where artists could thrive. The evolution of this profound architectural and artistic movement that was to shape Europe over the next two centuries can be appreciated here like nowhere else. Yet we both agreed that although it barely scratches the surface of its treasures, this guidebook itinerary provides a good introduction to the historic and cultural past of the city that shaped the evolution of Europe. The Ponte Vecchio, the oldest bridge in Florence, spans the Arno at its narrowest point. While it is believed there has been a succession of bridges in that spot since Roman times, the current structure lined with shops as was customary then, dates back to the early fourteenth century. But for me its most intriguing feature sits above the row of garish jewelry storefronts that run the length of the bridge. It is the enclosed private corridor commissioned in 1565 by Cosimo I de’ Medici to connect the Palazzo Vecchio, then seat of the ruling body of the Republic of Florence, with the Palazzo Pitti, his own residence immediately across the river. Designed by Giorgio Vasari, it is a stark reminder of a time when assassination was considered an expedient way to solve political differences. The Terrace of the Uffizi offers a close up view of the Palazzo Vecchio. 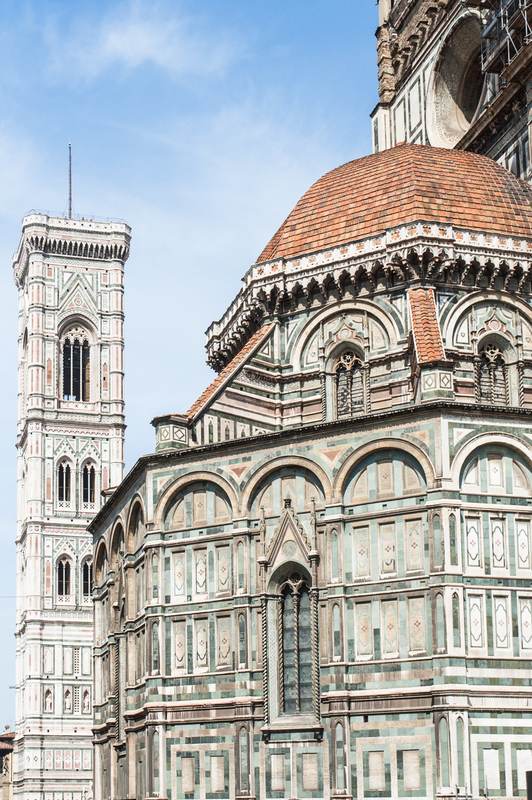 La Basillica Santa Maria Del Fiore is best known as the Duomo for its striking Brunelleschi dome. The Uffizi Gallery Built in the mid-sixteenth century for Cosimo I de’ Medici to house magistrates, administrative offices and state archives, the Palazzo degli Uffizi (Italian for offices) is located between the Arno and the Palazzo Vecchio. The third floor holds a mind-boggling collection illustrating the evolution of Italian art, displayed chronologically from Gothic to late Renaissance and beyond, in rooms opening onto a large gallery that runs the length of the building. The gallery is lined with antique marble statues. 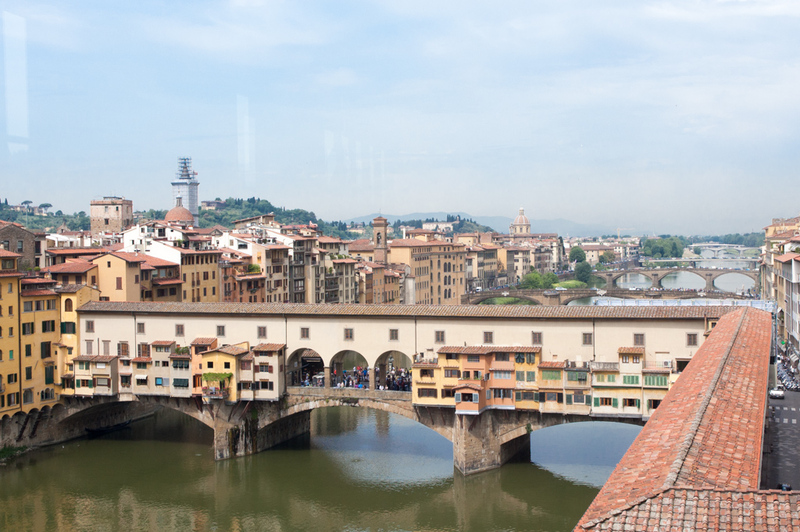 It also offers a superb view of the Ponte Vecchio and the Arno. The rooftop terrace coffee shop is worth a visit for its close up view of the tower of the Palazzo Vecchio and the dome of the Duomo. The interior courtyard of the Palazzo Vecchio. Piazza della Signoria and Palazzo Vecchio. 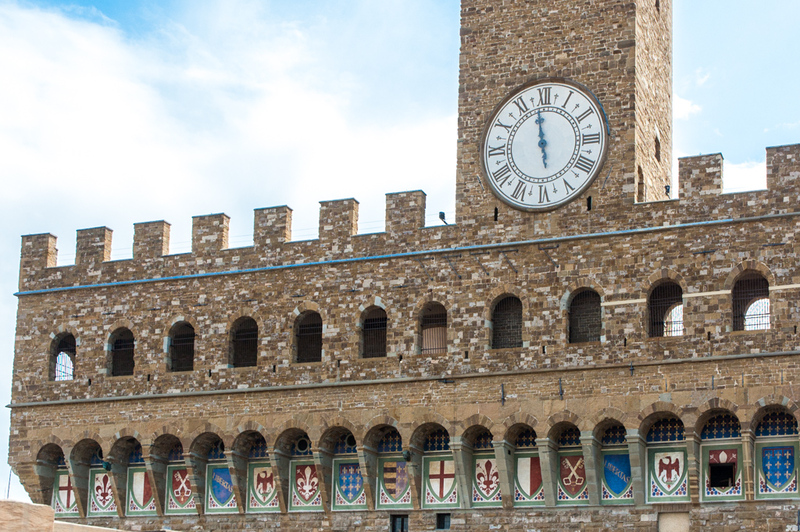 The political center of the city since medieval times, the Palazzo Vecchio opens onto the Piazza della Signoria (or Government Square), which remains to this day one of Florence’s most famous and busiest squares. 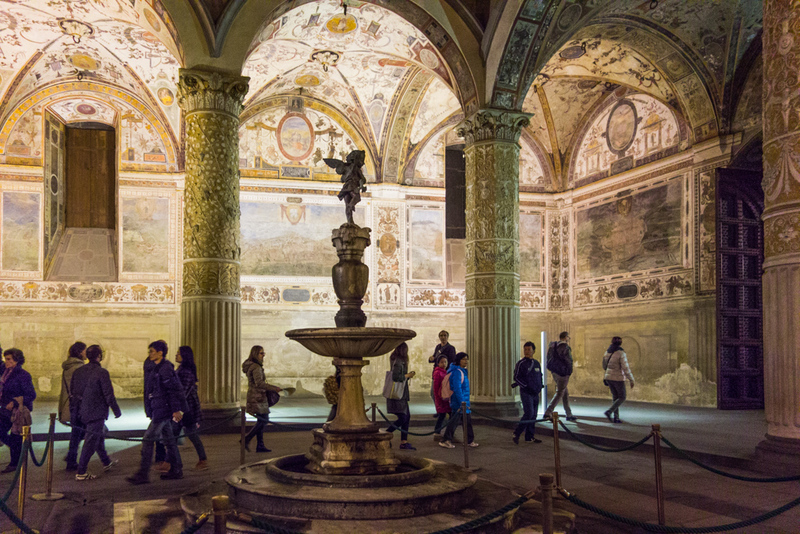 The visit of the Palazzo Vecchio includes the elegant private apartments as well as the internal courtyard and the grand public rooms with their frescoed walls and elaborate coffered ceilings to give an interesting insight into the life of the aristocracy of the time. La Galleria dell’ Academia is part of the Academy of Fine Arts of Florence. A number of Michelangelo’s masterpieces are displayed here, including his four unfinished Prisoners, intended for the tomb of Pope Julius II, and his world-famous 5.20 meter (17 foot) white Carrara marble statue of David. Originally set on the Piazza della Signoria, the David was moved in the nineteenth century to a specially constructed gallery in the Accademia. A copy now stands in its place outside the Palazzo Vecchio. The remainder of the art collection, mainly works from the Gothic and early Renaissance periods, was originally assembled to educate students. The Duomo and the Giotto’s Bell tower are faced with elaborate marble panels. Duomo The Basilica di Santa Maria del Fiore or Duomo is one of the largest churches in Italy and one of the major tourist attractions in Tuscany. The exterior is faced with white marble panels outlined in green and pink. 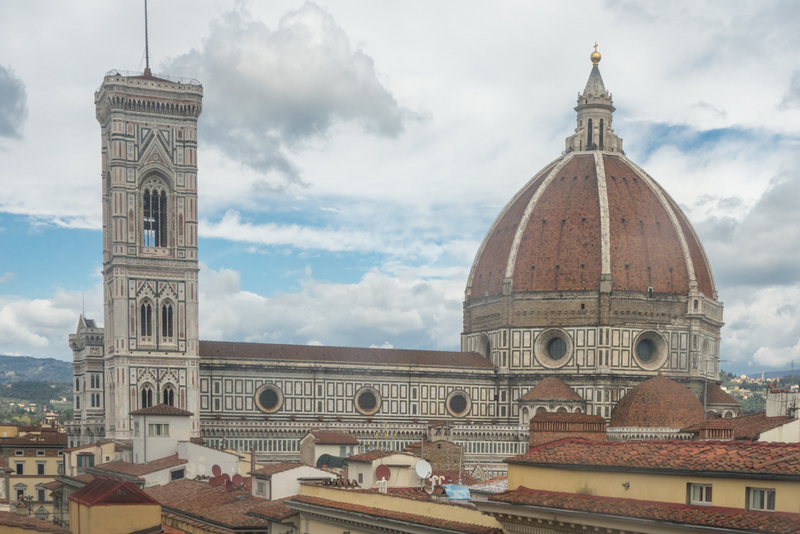 Started in 1296 in the Gothic style, it was completed in 1436 with addition of the Brunelleschi dome, which remains today the largest brick and mortar dome in the world. The façade was left bare until the nineteenth century when it acquired its elaborate Gothic Revival marble design. The Ospedale degli Innocenti (Hospital of the Innocents or Foundling Hospital) on the Piazza della Santissima Annunziata, just a short walk behind the Duomo, was Fillipo Brunelleschi’s first architectural commission. Its gracious loggia of nine semi-circular arches facing the piazza set the stage for the development of an architectural style based on classical antiquity. The Santa Croce Basillica has a nineteenth century Gothic Revival marble facade. 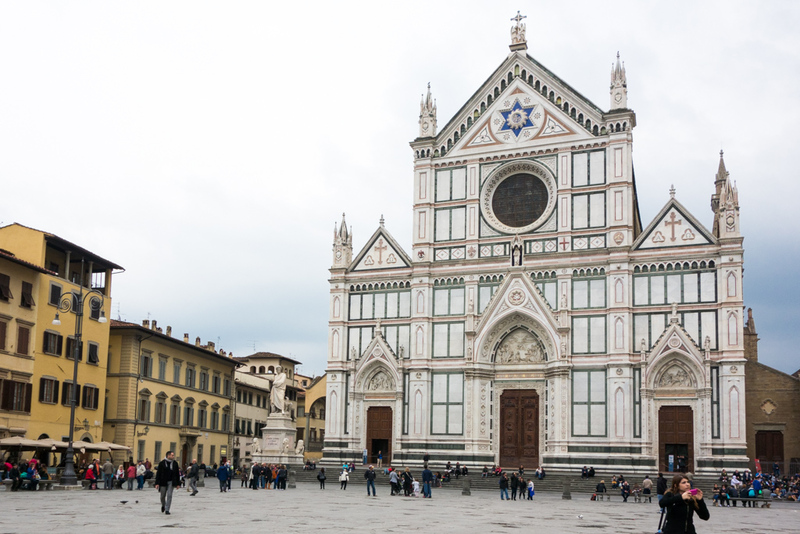 La Basilica di Santa Croce (Basilica of the Holy Cross) is the principal Franciscan church in Florence. Located on the Piazza di Santa Croce, about half a mile south-east of the Duomo, it houses the burial chapels of some of the most illustrious figures of the Renaissance, including Galileo, Michelangelo and Machiavelli, as well as nineteenth century musical great Gioachino Rossini. It acquired its Gothic Revival marble façade in the nineteenth century. 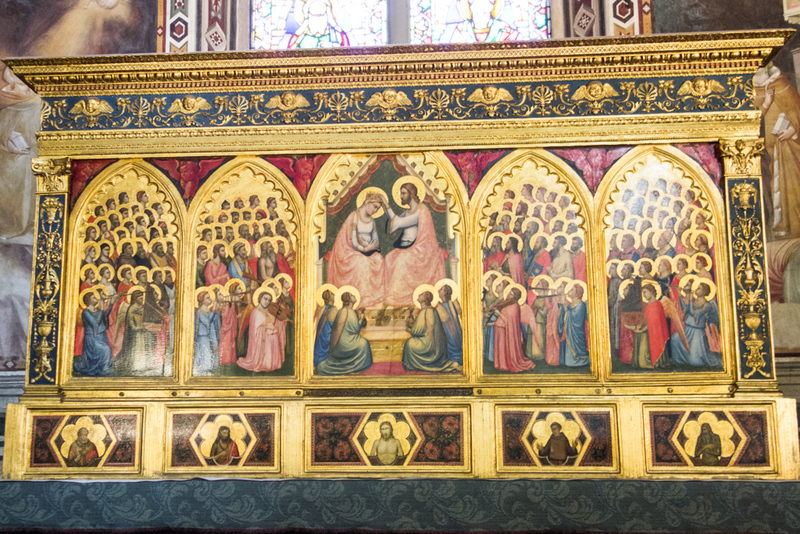 The incandescent Giotto polychrome Coronation of the Virgin in the Santa Croche Basillica. While I enjoyed these “guidebook musts” on my first visit to Florence, I also developed a yearning to return. Florence has become a frequent destination for me in recent years. Along the way, I have discovered my own personal favorites among the less frequented architectural and artistic gems as well neighborhood markets and local eateries. I’ll share these next. Stay tuned for the sequel. 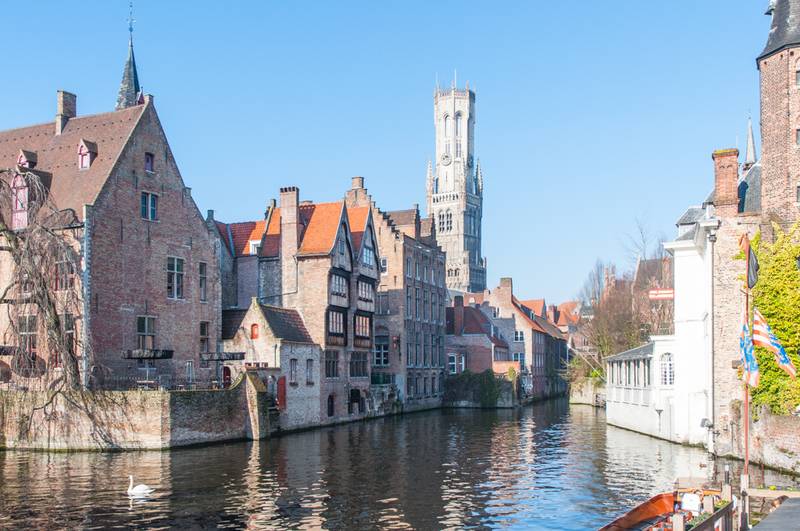 Bruges, just one hour’s drive from the cosmopolitan center of Brussels, is one of these enchanted cities European fairy tales are made of; cities vanished into the sea at the height of their grandeur to reappear untouched by time every 100-years or so. 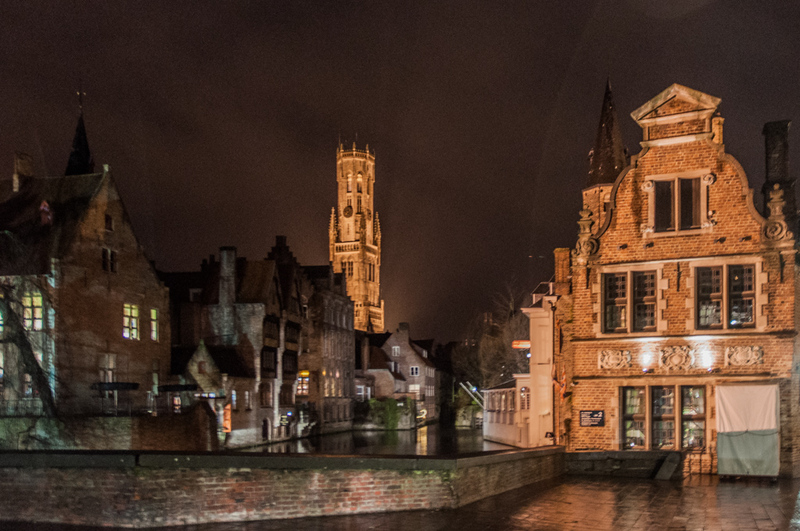 Bruges, however, was simply abandoned by the sea. The thirteenth century Belfy dominates the skyline of Bruges. The first records of its existence trace back to Julius Caesar’s conquest of the area in the first century B.C., when fortifications were built to protect the coastal settlement from North Sea pirates. Over the next millennium it grew into the most important citadel of the Flemish coast. 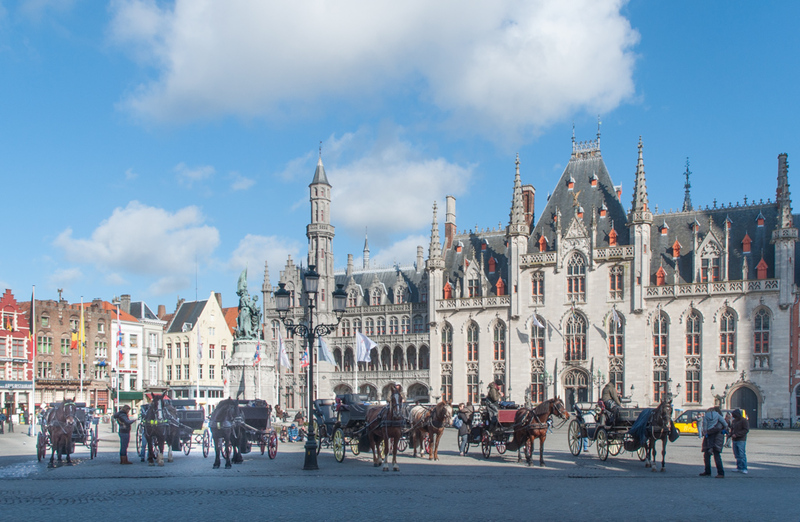 By the time it received its city charter in 1128 Bruges was on its way to becoming a major seat of trade between the Flemish countries and the Mediterranean, ushering in a golden age that was to last three centuries. Great commerce wealth flowed in and Bruges became one of the artistic hubs of Europe. Then the late fifteenth century, the Zwin River silted up. Deprived of its access to the North Sea, the city became a sleepy backwater town. Horse-drawn carriages await tourists in front of the Provincial Courthouse. Grand gothic public buildings line the main canals. Bruges slept for 400 years, when the development of twentieth century mass tourism turned its long-ago demise as a commercial powerhouse into posterity’s gain. Today, with its gothic architecture still intact Bruges is one of the most visited medieval cities in Western Europe. High-speed trains have put it within an easy three-hours’ reach of Paris, Amsterdam, London, and the western part of Germany. Hordes of sightseers stop for a quick look on their way from one major city to the next. These daytime tourists mainly congregate around the Grote Markt (Market Square), the grandest square and commercial heart of Bruges since the thirteenth century, dominated by its 272 foot (83 meter) belfry, and the Burg (Town Square) that was and remains to this day its administrative core. The cobbled streets surrounding the two squares are lined with shops brimming with the chocolate and lace for which the city is famous, conveniently ensuring that visitors do not have to stray far afield to load up on souvenirs, and miss most of the romance of the city. The elegant lounge of the Pand Hotel is filled with antiques. The Pand Hotel is breakfast is prepared to order. Every decade or so, I conjure up an opportunity to return to Bruges for a couple of days. The historic center is a treasure trove of centuries-old mansions reborn as lovely boutique hotels that combine the latest in twenty first century comforts with the all the charm of their bygone heydays. 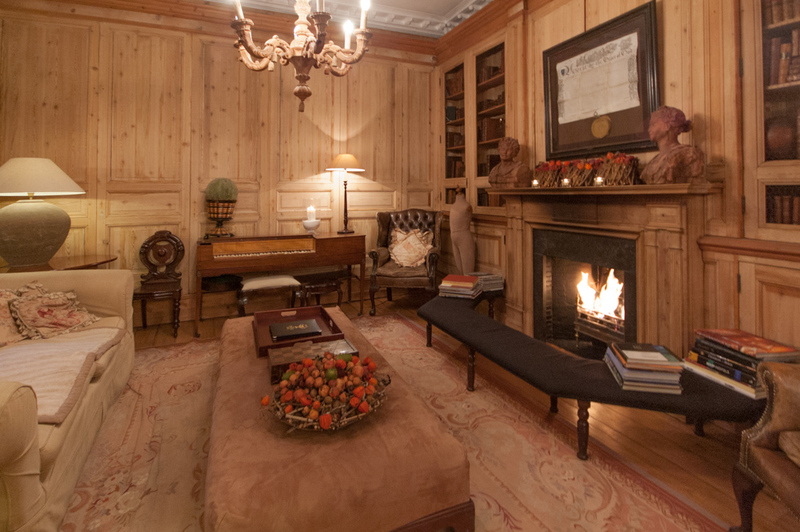 My personal favorite retreat is the Pand Hotel, an early eighteenth century carriage house turned luxury boutique hotel, on a tiny tree-shaded square right in the heard of the city. Owned and managed for a couple of generations by the Vanhaecke family, the property has been personally decorated by Mrs. Chris Vanhaeke. An enthusiastic antiques collector, she used superb pieces from her own collection to give the hotel the authentic feel of a gracious home from Bruges’ romantic past, with the welcomed addition of a whirlpool bath in most rooms and Wi-Fi access everywhere on the property. With its warm, attentive staff and wonderful, prepared to order champagne breakfast, I find the Pand reason enough to return to Bruges anytime. A lone cyclist rides along the tourist-free street by the Jerusalem Church. Built in the thirteenth through fifteenth centuries, the grand gothic Church of our Lady with its 401 feet (122 meters) bell tower remains to this day the tallest structure in Bruges. It’s quite a climb but I am rewarded with the best view of the city and surrounding countryside. The church is also home to a white marble sculpture of the Madonna and Child by Michelangelo. The cradle of Flemish Art during the renaissance, Bruges has retained many works of the Flemish Primitives masters Jan van Eyck, Rogier van der Weyden, Hugo van der Goes and Gerard David among others. While some their paintings are scattered around the churches and public buildings of the city, the most important collection is at the Groeninge Museum. Then in a quiet neighborhood north of the city center, there is the small Jerusalem Church with its unusual octagonal tower, and even more unusual history. Completed in 1470, the church is a replica of the Holy Sepulcher in Jerusalem, including a faux tomb of Christ. It consists of a nave, with right in the center of it the tomb of Anselm Adornes (deceased in 1483). The church is still privately owned by his descendants, originally merchants from Genoa, Italy, settled Bruges in the thirteenth century. 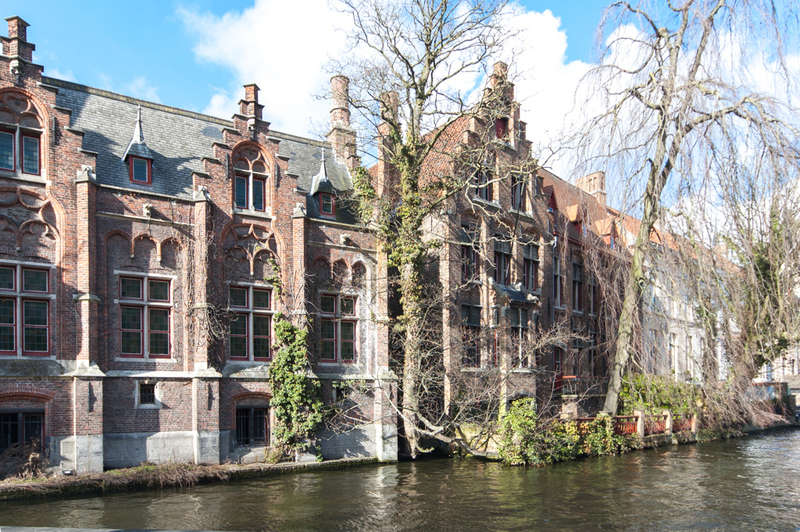 The Bruges Lace Museum is next door in the former Adornes mansion. Individual homes surround the serene park of the Beguinage. I never miss a return visit at the Beguinage, a pastoral retreat at the edge of the historic center. 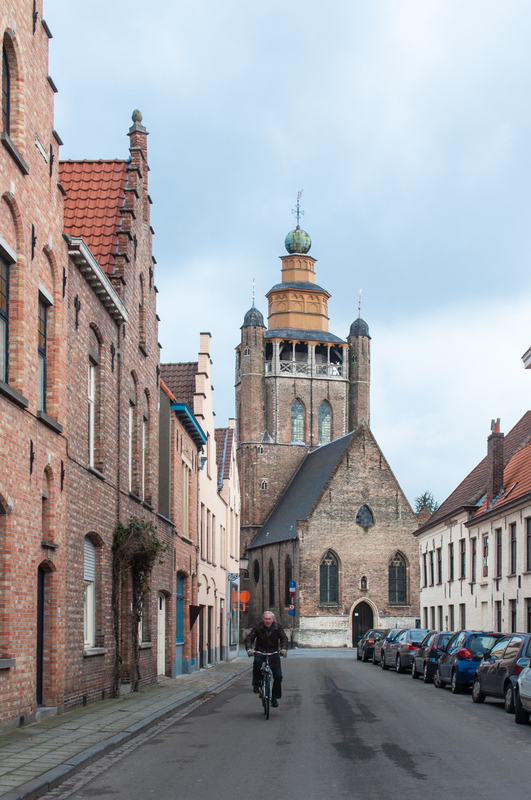 It is a walled religious community founded in the thirteenth century by beguines (women who wanted a life dedicated to God without retiring from the world). Inside, some 30 individual medieval homes, many with small walled-in front gardens and a sixteenth century church surround a central park shaded by soaring trees. The park, church and largest house, originally the home of the Grande-Dame who ruled over the Beguinage and now a small museum, are open to the public. 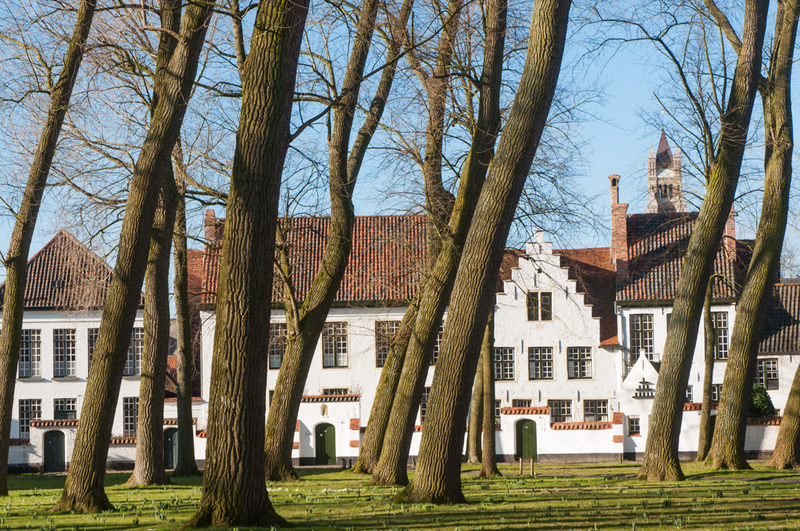 Since the Beguinage is now a Benedictine nuns’ community, visitors are required to keep silent, making the park a serene hideaway only a few minutes from the city center. As dusk descends on the city, the daytime visitors fade away. The ancient buildings are bathed in the glow of soft floodlights, their reflection mirrored in the stillness of the canals. After dinner in one of the cozy local taverns, I walk along the deserted streets echoing with the steps on cobblestones and muted voices of occasional passers-by. High in one of the many towers that dominate the jagged roofline, chimes mark the passing evening hours. This is when Bruges finally reveals itself as it must have been at the peak of its medieval romance. 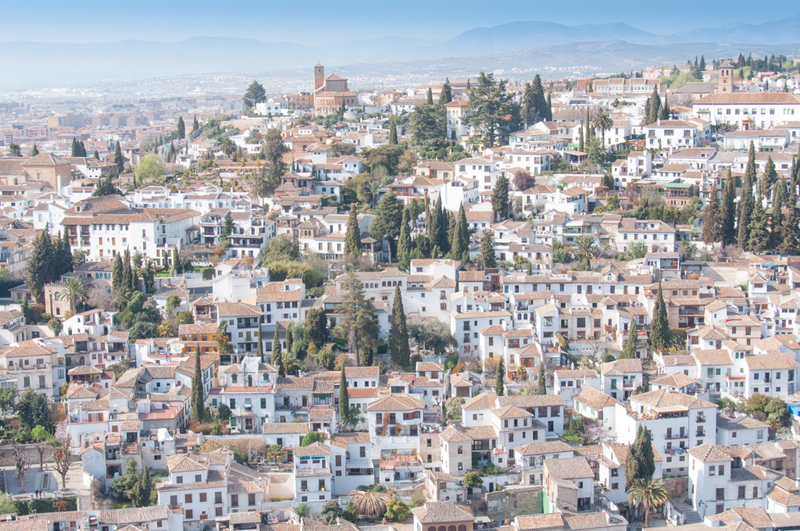 While the region surrounding Granada is known to have has been populated from at least the eighth century B.C., the present-day city wasn’t founded until the early eleventh century, recently by the standards of the Mediterranean basin. Three centuries into the Moors rule of the area, a civil war ended the Umayyad Caliphate. Victorious Berber general Ziri ibn Manad established an independent kingdom for himself. However, the local capital (Elvira) was located on a low plain, which as he had himself demonstrated made it difficult to protect from attacks. So the newly minted Zirid ruler decided to transport his quarters to higher grounds. Albacin is the ancient Moorish medina of Granada. The hilltop hamlet of Gárnata (altitude 738 meters) seemed a better bet. Especially since it came with an ancient military fortress (or Alcazaba) already in the neighborhood. In short order the site was transformed into one of the most important cities of Al-Andalus, as the Iberian Peninsula was then called. By the end of the eleventh century, the Alhambra had become a walled military citadel. The city itself had spread across the Darro River to include the Albaicín, a steep labyrinth of narrow streets lined with whitewashed houses and secluded inner gardens (or cármenes). It is this ancient Moorish medina that I choose to call home for my visit to Granada. View of the Alambra from my window at La Casa del Aljarife. The taxi from the train station in the lower, contemporary part of the city drops me off at the bottom of the hill on Plaza Nova. It’s on foot after that, an ankle-twisting noisy walk rolling my luggage uphill over cobblestones that randomly morph into stairs. Ten sweaty minutes later, I arrive at La Casa del Aljarife and feel instantly rewarded for the climb. This tiny Bed and Breakfast is perched high on the hill, a typical narrow multi-level seventeenth century house in the far corner of the handkerchief-size Placeta de Cruz Verde. My host, Christian Most, takes over the luggage-hauling up the steep, centuries-worn stairs all the way to the fourth floor. La Casa del Aljarife has only four guest rooms. Mine is a light-filled retreat at the very top of the house, with an eye-level view of the Alhambra. The patio of our Albacin home is filled with trees in bloom. 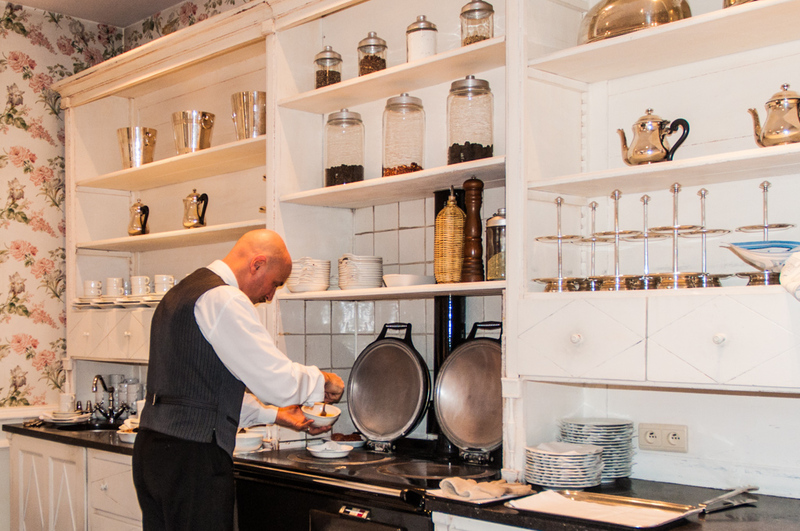 In the morning, Christian dishes out hearty Anglo-Saxon breakfasts in the inner courtyard filled with fruit trees in blooms and bird songs. It wouldn’t take much convincing to get me to linger in the serene cármen, but the vibrant andalusian world is calling. It’s uphill again to the highest point of the Albaicín, the Plaza de San Nicolas famous for its panoramic view of the Alhambra against the snowy backdrop of the Sierra Nevada. The Albaicín is a neighborhood perfect for getting lost. I follow narrow lanes lined with hole-in-the-wall bazaar shops and eateries sending out cooking smells that speak of North African souks. My wanderings invariably lead to some tiny placeta, where I can rest my cobblestone-weary feet over sweet mint tea. This is how I come across the Jardines de Zoraya. I step in for tea in the shaded garden one afternoon, and return the next evening for great local food and even better Flamenco. Granada has a long Flamenco tradition, in the Albaicín and even more so in Sacromonte, the historic home of the city’s thriving Roma community (often called Gypsies, or Ginatos). They settled in the Sacromonte neighborhood of Valaparaiso Hill to the north of the Alhambra in the fifteenth century, after the combined forces of Aragon and Castile finally tossed out the Moors. Sacromonte is famous for its many whitewashed caves cut into the rock, some still used as residences today. 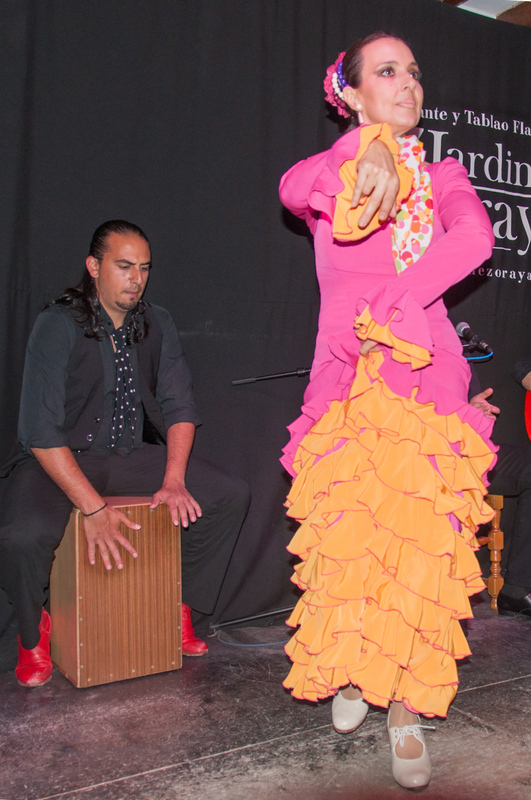 It is the home of Zambra, a Flamenco variation with a distinct oriental feel. Patio in a Nastrid Palace in the Alhambra. This is how Moorish poets saw the Alhambra. After days of admiring it from afar, I finally get to set foot into this sublime masterpiece of European Islamic art. The Alhambra is first of all a fortress with heavily fortified peach colored brick walls that snake around the crest of al Shabika hill. Over the centuries, succeeding dynasties expended it until it became a city onto itself, and the seat of power of the Nasrid Emirs. The palaces that once housed the rulers and their court are deep within the walls, surrounded by a small town that was home to lesser nobility and common people, and a military area with the barracks of the royal guard. The sheer size and complexity of the site are overwhelming. 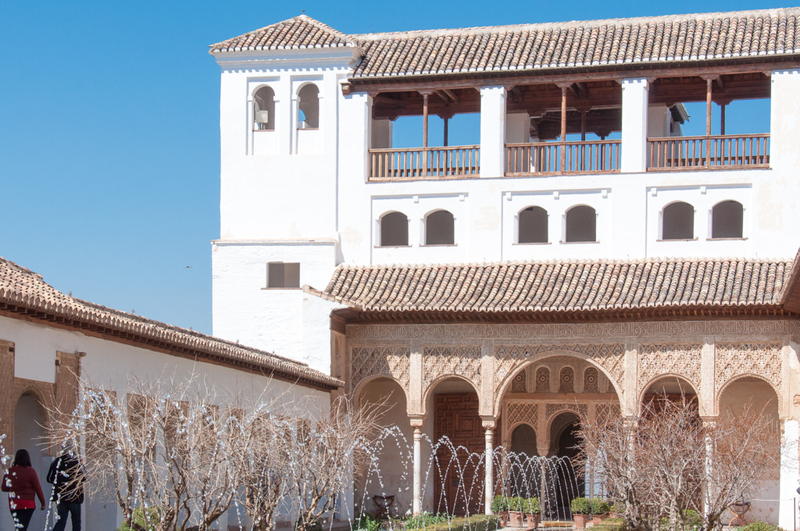 After a day spent exploring every corner, awed at every turn by architectural grandeur and stunning artistic details, it is a relief to escape to the Generalife Palace. A five-minute walk over a bridge outside the fortifications, I enter the legendary Generalife gardens. Built on the south slope of the Cerro del Sol (Hill of the Sun), the gardens and orchards were originally created to supply food for the Alhambra. The palace was added the fourteenth century as a summer retreat and country estate for the then Nasrid monarch, Muhammad III. Generalife is one of the oldest surviving Moorish gardens anywhere. Today, the exactingly restored Alhambra and Generalife are considered a pinnacle of Moorish art and Andalusian history. They are, along with the Albaicín classified as UNESCO World Heritage Sites. It is prudent to purchase well tickets ahead as visitors are strictly limited to 6,600 per day. Only one-third of these tickets are set aside for day-of-visit purchase, This may seem like a lot until confronted with the endless lines at the box office. Only 300 visitors are allowed every half-hour by pre-determined schedule into the Nasrid Palaces. They may also be purchased by internet ticketmaster.es . However Ticketmaster only has access to a limited number of tickets that are often sold out one week or more ahead of time. della Frontera overlook the Guadalate River Valley. 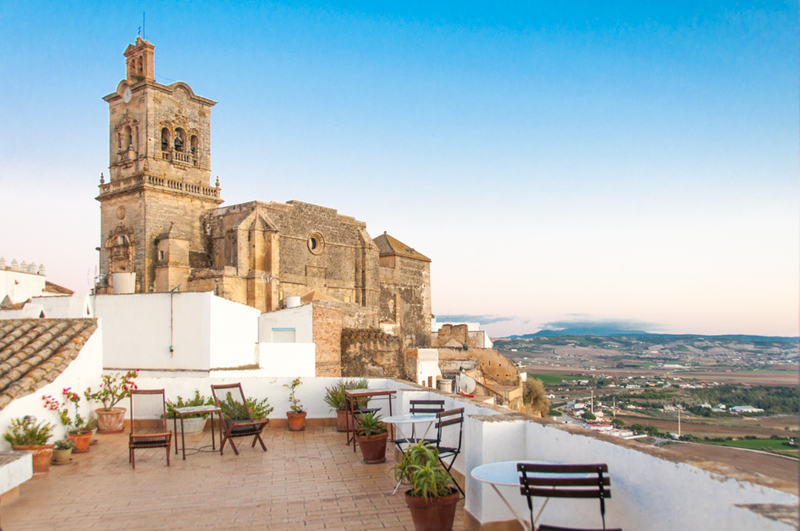 After a week of enjoying the urban charms of Seville, a two-hour southward bus ride takes me to Arcos de la Frontera, the pearl of famous White Villages, for a taste of timeless Spanish culture. The old village clings to the very top of a narrow limestone ridge, a tangled maze of cobblestone streets lined with whitewashed medieval houses and ancient churches. From my room atop one of these historic homes, the view plunges abruptly down to the fertile valley of the Guadalate River and the rolling plain beyond. The whole place is a photographer’s paradise. The Rio Guadalvin runs through the center of Ronda. Another three-hour bus ride west, and I am in Ronda. I am a fan of Spanish busses. Comfortable, punctual and inexpensive, they are a great way to get from one small town to the next. 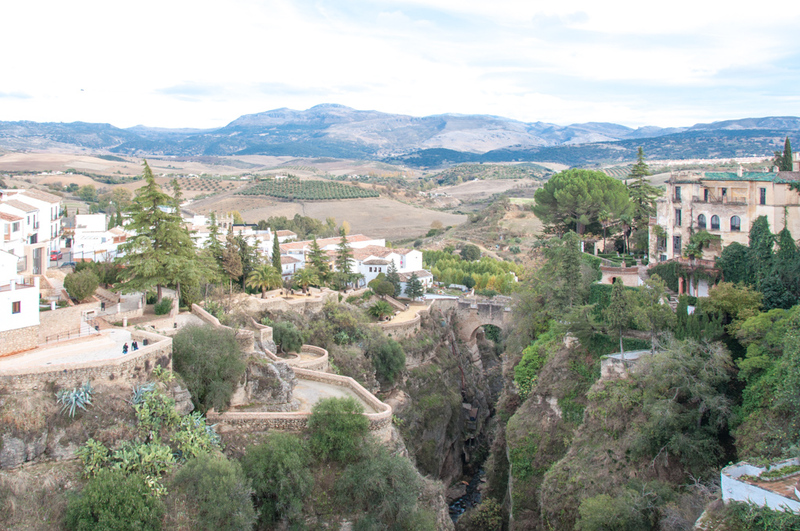 Ronda is an eagle’s nest of a town famous for dramatic views and the 150 meter (500 foot) deep El Tajo gorge of the Rio Guadalvin that runs through its center. Celts, Phoenicians, Romans and Moors habited the area in turn before it was conquered by the Catholic Kings. Most left interesting marks of their presence. Ronda and the local Romero family played a major role in the development of Spanish bullfighting as it is known today. While definitely not a supporter of the sport myself, I enjoy visiting the spectacular eighteen century Plaza de Toros. The vast bullring, 66 meter (217 foot) in diameter is surrounded by a stone passage and two layers of raised covered seating. The roof circular roof if supported by 136 pillars that hold 68 arches. The complex also houses a small museum dedicated to the sport. 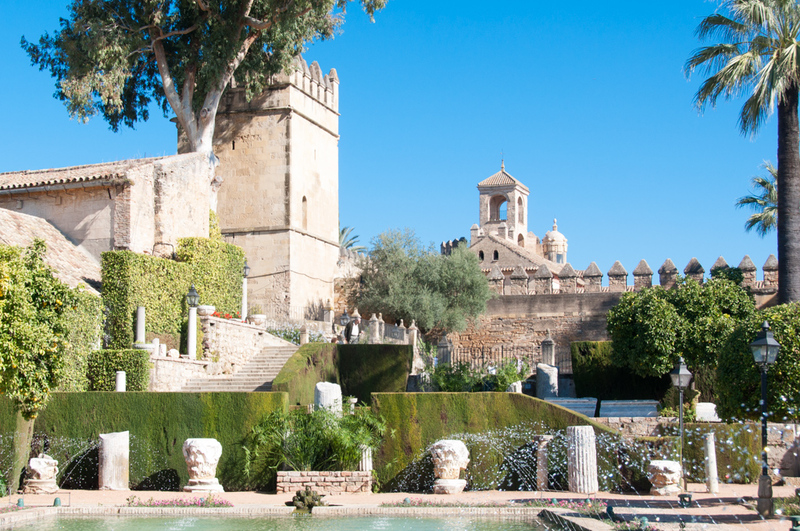 The Alcazar offers a fine view of La Mezquita and the Cordoba skyline. The last stop of this journey is Cordoba where I can’t get enough of La Mezquita, the Great Mosque turned cathedral in the center of the historic town, considered one the most significant monuments of Moorish and Renaissance architecture. 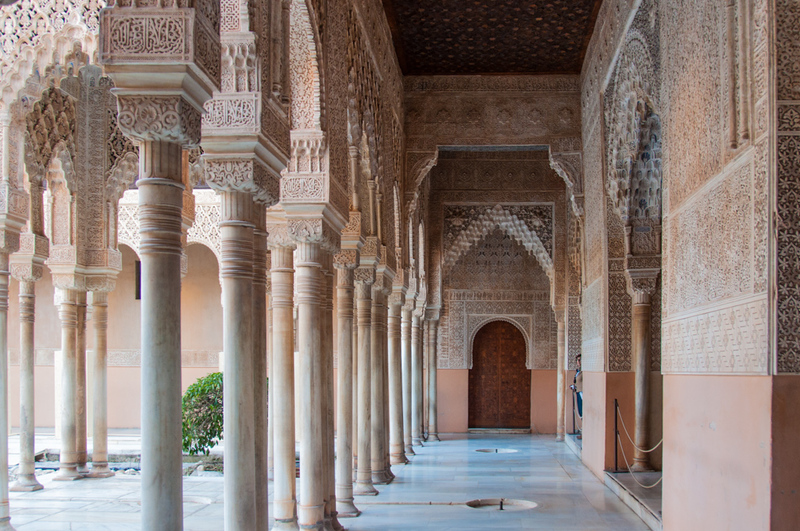 In its original mosque incarnation, it was the hub of Islamic community life in Al-Andalus for three centuries, serving as a teaching center as well as courthouse and place of worship. The building is constructed with 865 soaring columns of granite, marble, jasper and onyx, made from pieces of the Roman temple that previously occupied the site and other repurposed nearby Roman monuments. The sanctuary also has elaborately carved and gilded prayer alcoves. After Ferdinand III conquered Cordoba in 1236, the mosque was turned into a catholic church. A number of chapels were inserted over time within the expansive structure, most notably the colossal Renaissance cathedral nave. Near the Mezquita is the old Jewish Ghetto, home to the Sephardic House and the Synagogue. Then at the southwestern edge of the old town there is the Alcazar de Cordoba. The palace was the seat of the independent Caliphate of Cordoba. Over time it expanded to become a large compound with baths, gardens and one of the largest libraries of the era. It was reconstructed and further expanded by the Christian Kings following the 1236 conquest. So rich is the history of Andalusia and its architectural legacy that I feel this first visit has barely scratched the surface. I am already thinking of a return visit. Granada is next. As is the case with many of the great historic cities of the Mediterranean basin, the origins of Seville are shrouded in legends. Hercules himself is said to have taken a break from his better-publicized great deeds to create the original settlement of what is now the capital of Andalusia, Spain’s southern-most region. The Moors’ Torre del Oror on the Guadalquivir River. In the millennia that followed, others came to lend a hand in shaping the city as we know it today. It became Hispalis to the Romans after they evicted the Carthaginians. Rome undertook its customary construction program, a few remains of which endure to this day including the twin columns that dominate the vast La Alameda de Hércules Square on the north side of the city’s historic center. Then came the Vandals and the Visigoths successively, who left nothing but their usual devastation before being abruptly tossed out by the Moors in 711. This ushered in the Islamic Empire of Al-Andalus that was to endure for half a millennium, leaving a stunning architectural and artistic imprint throughout the region. The Spanish Baroque Archbishop’s Palace. Then in 1248, the Christian King Ferdinand III of Castile conquered the area. The Moors’ Palace (the Alcazar) became the Castilian Royal residence still used today as the local residence of the royal family and mosques morphed into churches. Enter Christopher Columbus. Upon his return from the New World in 1493, Seville managed to co-opt the monopoly on trans-oceanic trade for its port on the Guadalquivir River. Prosperity ensued and the city became a major economic and cultural center of the Baroque era. To this day it is a unique hybrid of Islamic and European architecture and traditions, and a fascinating place to start my discovery of Andalusia. 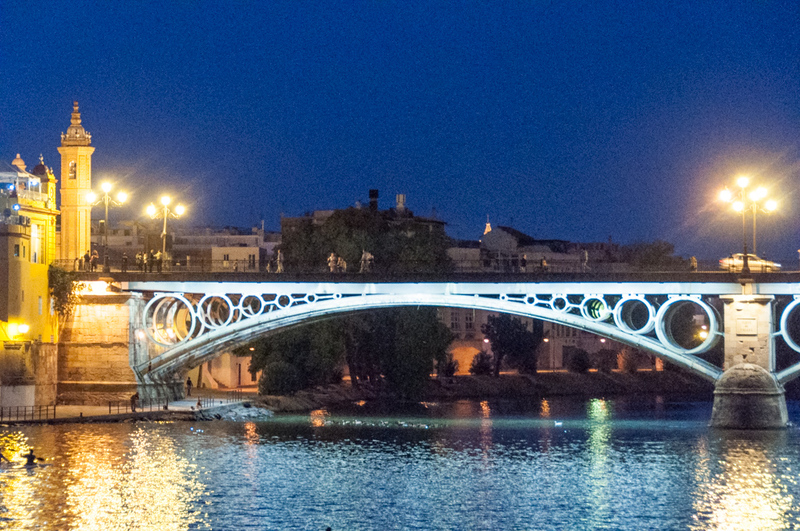 The Triana Bridge over the Guadalquivir. Since my first random wanderings lead me to the bank of the Guadalquivir, I board a ship for hour-long dusk cruise. 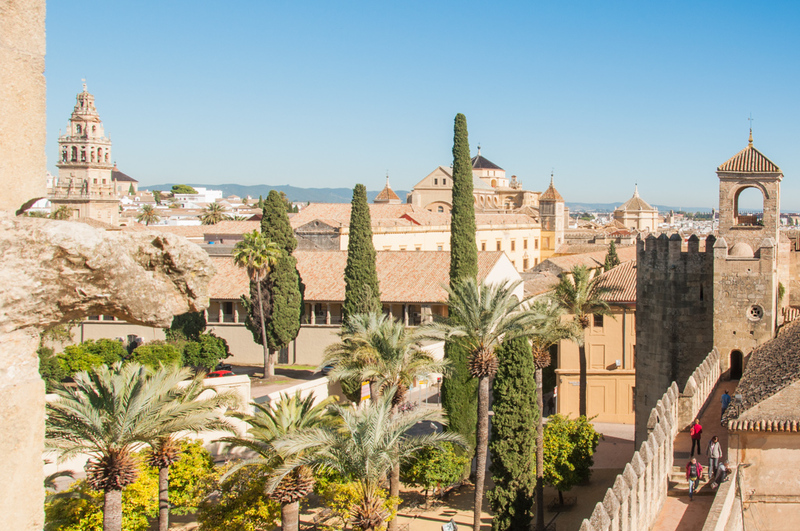 In addition to offering a beautiful panorama of both sides of the city, highlights include the Torre del Oro, a polygonal medieval watchtower originally built by the Moors as parts of the city ramparts to control river access. While the golden tile facing that gave it its name have long vanished, it still a gleams in the early evening light. Further down river the Isabel II (or Triana ) Bridge, a superb example of nineteenth century iron architecture, leads to the historic working class Triana neighborhood, famous to this day for its ceramics and flamenco music. 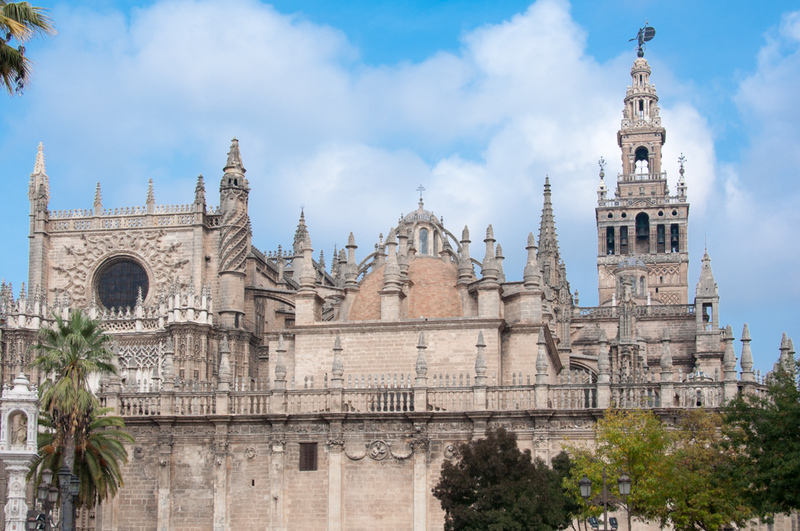 The Santa Maria del la Sede cathedral is the largest gothic cathedral in the world. During the next few days, I explore the area around the Cathedral (Santa Maria del la Sede), the largest gothic cathedral in the world. Its fifteenth century builders used some columns and other elements from the mosque that previously stood on the grounds, including the Giralda. 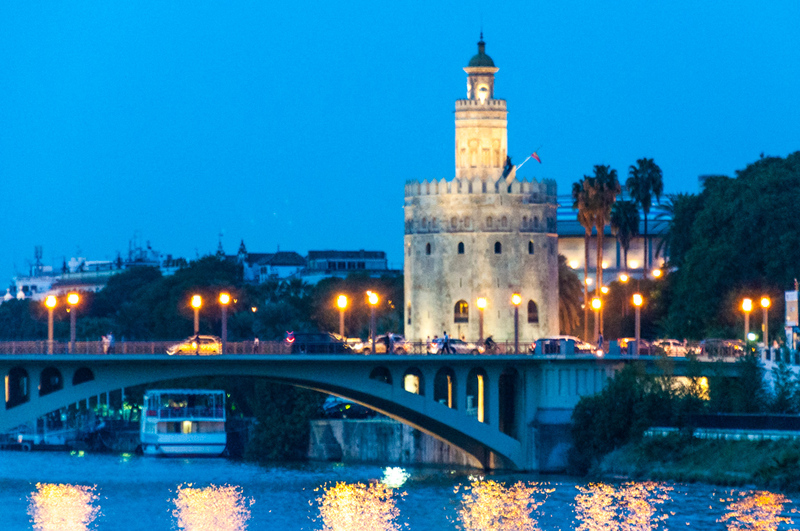 Once a minaret, the 300-foot bell tower, now Seville’s iconic symbol, offers a unique view of the city. Inside the cathedral, a grand mausoleum is said to holds the remains of Christopher Columbus. Neptune Fountain in the gardens of the Alcazar. I wander in the courtyards of the Alcazar with their lacy stone and woodworks and their intricate Islamic geometric tile works. The gardens are filled with orange trees and the trickle of countless fountains. And I lose myself in the labyrinth of medieval streets of Barrio Santa Cruz, the Jewish ghetto until the Jews were driven from Spain by the 1492 edict of King Ferdinand and Queen Isabella. 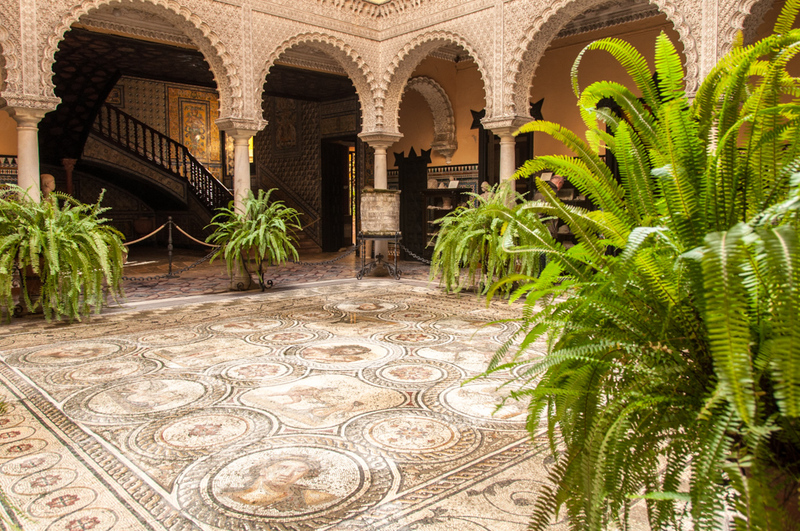 The interior patio of the Lebrija Palace is paved with Romain mosaics. 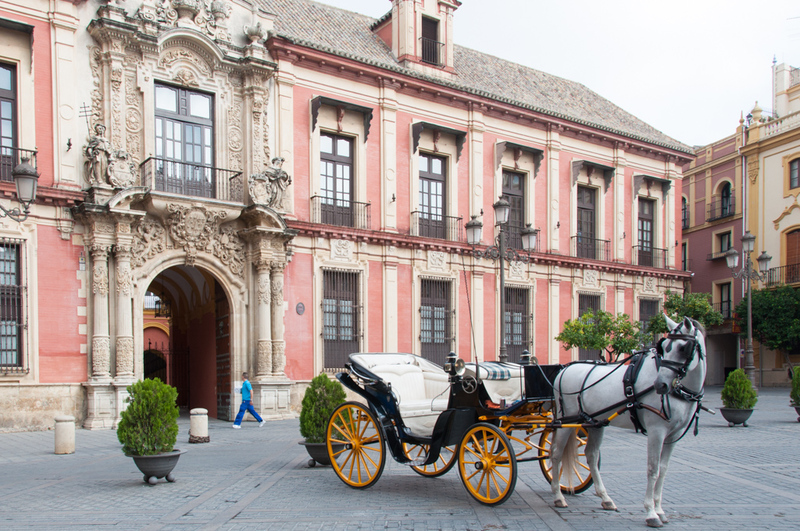 The Palacio de Lebrija is an ideal refuge for a rainy day. 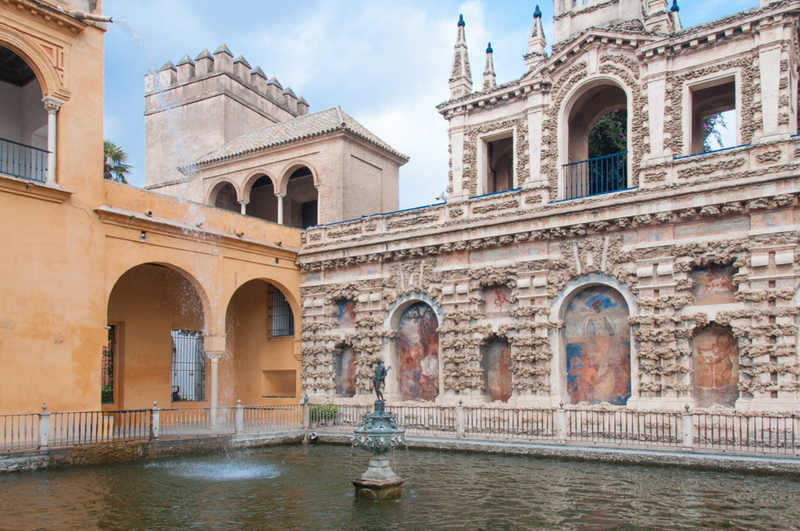 This little known museum is a typical Sevilliano family palace built around cloistered interior patios, restyled in the nineteenth century from original sixteenth century buildings by the Condesa de Lebrija. The Countess was an avid collector and the museum houses her eclectic private collection ranging from Greek, Roman, Etruscan and Persian ceramics to Louis XIV furniture and works by Van Dyck and artists of the Murillo school. On my first visit to Alsace several decades ago, I commented to my local host about the warm welcome I had experienced everywhere I went. “We have had plenty of practice with visitors over the past couple of millennia,” he quipped. Quite. First came the Romans in the first century B.C., who are credited with covering the undulating hills of this wedge of alluvial plain on the west side of the Rhine with the vineyards that are to this day the pride of the region. After the Roman Empire fell apart came the Allemans, who gave the region its language, then the Franks. That marked the start of a one thousand year tug-of-war that saw Alsace change hands multiple times between France and Germany; and develop a unique culture that, while remaining definitely French, has maintained strong German influences in its architecture, cuisine, arts and traditions. Window boxes overflowing with geranium are an Alsacian tradition. 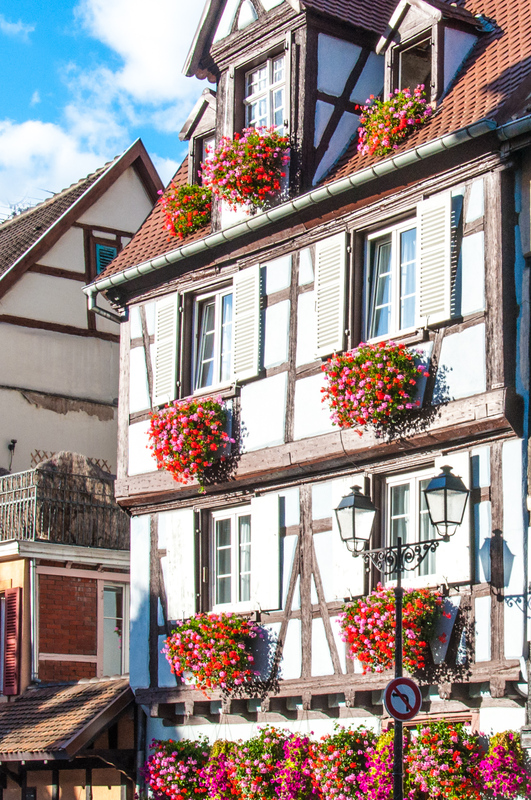 La Route des Vins, the 170 kilometer (106 mile) itinerary that meanders north to south from Marlenheim to Thann through the legendary Alsatian Vineyard abound with villages and towns filled with picture-perfect half-timbered facades and window-boxes of cascading red geraniums. Along the way, a proliferation of noted eateries dish out the succulent specialties for which Alsace is renowned, such as choucroute garnie (sauerkraut simmered in white wine with smoked pork and sausages), paté de foie gras (goose liver paté, which originated here in the eighteenth century), a wide variety of local charcuteries and smoked fish, and the pungent Munster cheese. For me, however, the ultimate destination of any visit to Alsace is Colmar, the self-appointed capital of La Route des Vins. Mainly spared the destructions of the French revolution and two world wars, it has an exceptionally large and well-preserved historic center for a city of its size (population 65,000). Its cobblestone streets lined with architectural treasures that span eight centuries of combined French and German evolution welcome visitors with the laidback cheerfulness of a small town. At the edge of the historic center, the especially picturesque La Petite Venise (Little Venice) neighborhood is clustered around a network of canals from the river Lauch, where tanners and fishmongers were once located. Farmers also used these waterways to ferry their products to the town market in small pole-propelled wooden barges. Similar barges are in operation today with silent electric motors, to allow visitors a close look at the ancient and still inhabited riverside homes. The dining room of l’Echevin overlooks the Lauch River. 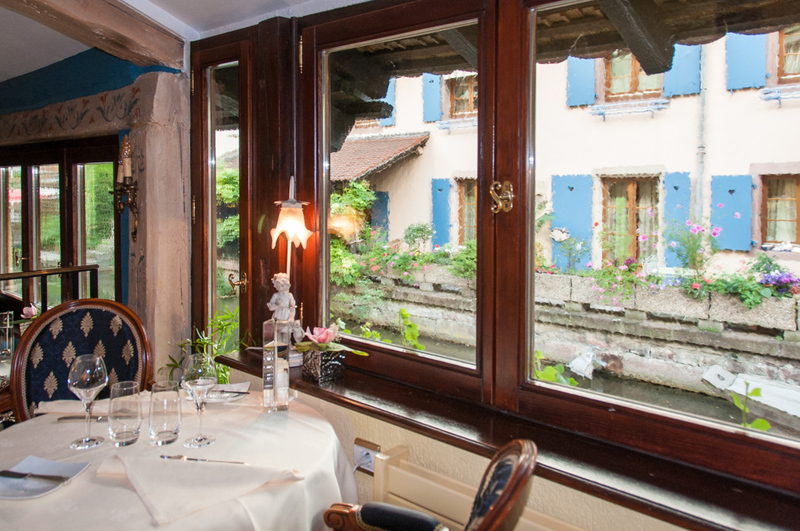 La Petite Venise is also home to the romantic Hostellerie Le Maréchal, created from four adjoining sixteenth century homes overlooking the river. Under the traditional steep tiled roofs, neat rows of windows are underscored by flowerboxes overflowing with the ubiquitous red geraniums. Inside, passageways have been opened through the common walls to link the various public areas, forming a maze of cozy nooks filled with antiques. At the rear of the property, the intimate dining room of L’Echevin (French for high ranking medieval magistrate) overhangs the river. In addition to its inviting setting the restaurant is a recognized destination for Alsatian gastronomy with two toques from Gault et Millau and three forks from Michelin to its credit. Ancient wrought iron signs still advertise local businesses. Center panels of the Isenheim Altarpiece at the Unterlinden Museum in Colmar. The opportunity to roam at leisure through entire neighborhoods of meticulously maintained medieval houses and the prospect of a couple of superb dinners at L’Echevin would be reason enough for a weekend break in Colmar, especially now that several daily TGVs (short for Train à Grande Vitesse or high speed train) make it an easy three hour trip from Paris. 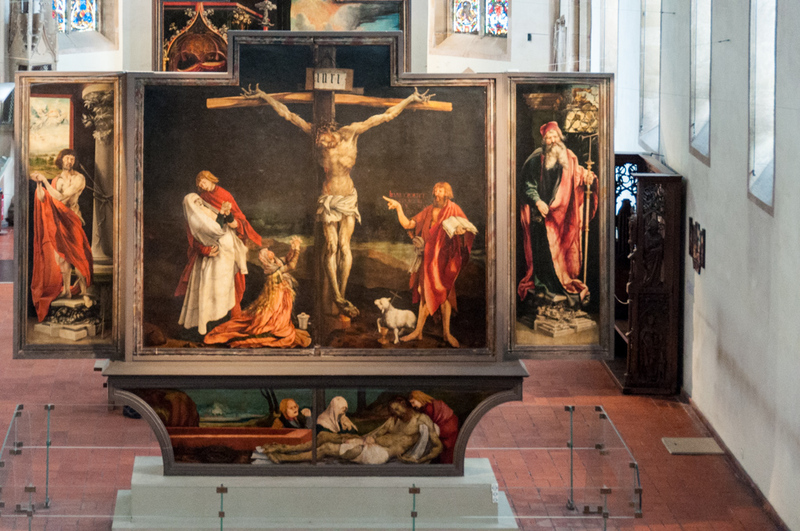 But on this recent visit, the lure was the town’s foremost artistic treasure: the striking Isenheim Altarpiece, considered Matthias Grünewald’s greatest masterpiece, originally painted in 1512-1516 for a monastery in nearby Isenheim. After undergoing extensive restorations in anticipation its five hundredth anniversary, it had been recently returned on display at the Underlinden Museum. Housed in a former thirteenth century convent for Dominican sisters, the museum also holds a major collection of Upper-Rhenish medieval and early renaissance sculptures and paintings, including several altarpieces by native son Martin Schongauer as well as works by Lucas Cranach the Elder and Albrecht Dürer. 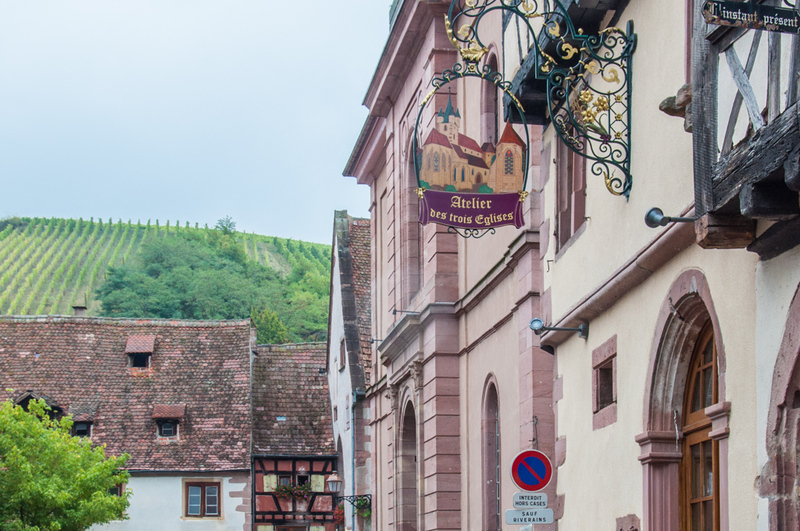 Riquewihr is surrounded by some of the most prized winegrowing land in Alsace. 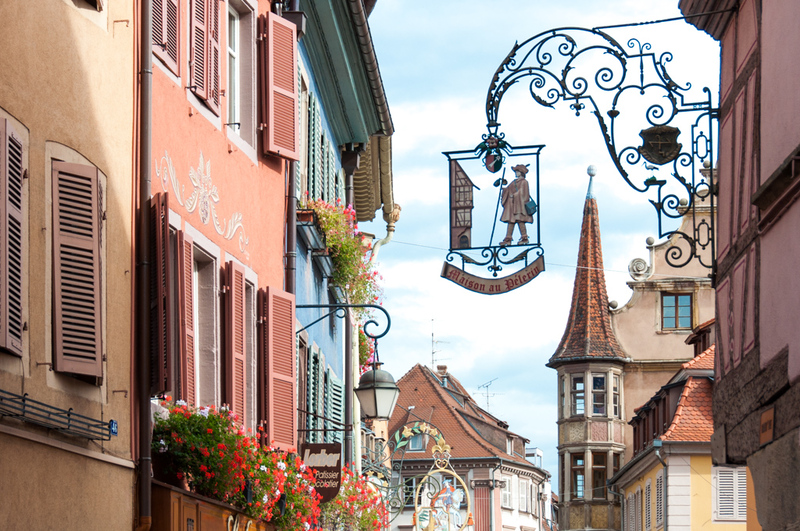 Riquewihr is classified as one of the most beautiful villages in France. 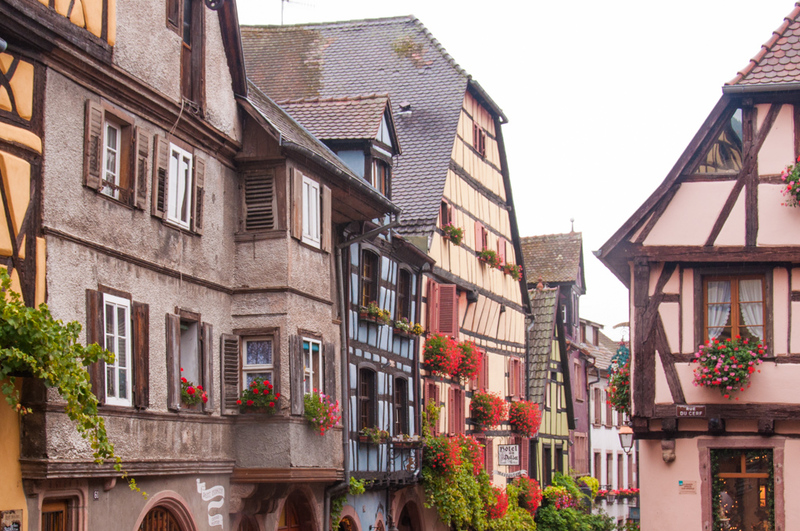 For me, no visit to Colmar is complete without a side trip to Riquewihr, the walled village classified as one of the most beautiful in France, a mere 12 kilometers (seven miles) away. Nestled in the middle of some of the most prized winegrowing land in the region, it is still home to families who trace their uninterrupted winemaking tradition back to the early seventeenth century. There I looked forward to a visit to my favorite vintner, Hugel and Sons, and a walk up the hill beyond the city walls to their venerable Schoenenbourg vineyards, reputed since the Middle Ages for producing some of the finest Riesling in the world. But it was raining on the day of my visit, hard enough to postpone the Schoenenbourg until next time. Instead, Etienne Hugel, the current head for the vinery took a few of us under the historic sixteenth century building of the Hugel headquarters for an extensive tour of the cellars. We set off through a succession of vaulted halls that reach deep under the old town. Wines are maturing there in rows upon impressive rows of giant oak casks, including the famous Sainte Catherine dating back to 1715, still in use and a Guinness World Record holder, before ending our tour in the tasting room. A warm welcome indeed! Visits of the Hugel cellars are by prior appointment only.